Smoked ox cheeks. Soft as butter and drool inducing flavour. A luscious aroma of beef and pork wafts on the air of this tiny restaurant bar whose footprint is similar in size and layout to a child’s bedroom and en-suite bathroom. The small space with its thirty covers is as would be expected, massively over-subscribed with queues forming outside half an hour before the opening. The continuing trend of food trucks turned restaurants continues to be the new torment of the lazy and impatient or the golden age of the patient diner, depending upon your perspective and views on queueing. For those persistent enough to make it to the front of the queue, you will be offered the chance to wait in the bar for some time before a table becomes available. Here you have the chance to get some drinks in you before the main event. Of special note on the menu is the ‘Pickleback’. 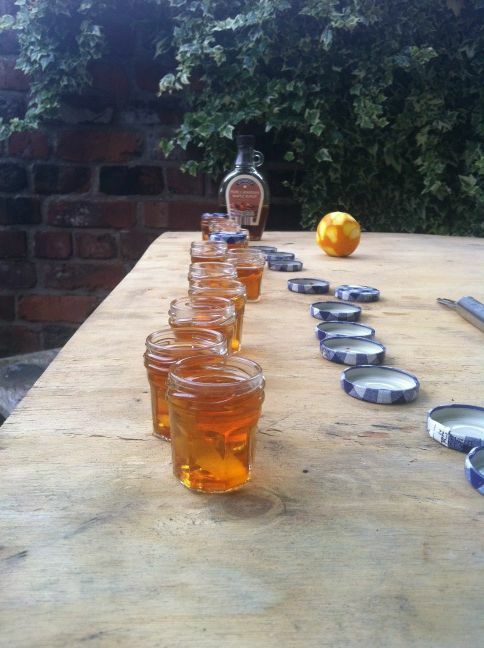 You will be offered two shot glasses; one containing bourbon and the second containing pickling vinegar. My first thought was ‘What the hell, why not’ but maybe it should have been ‘What the hell? That’s weird’. Regardless, it was quite the experience with the bourbon taking away some of the bitter notes of the vinegar and leaving you with a strong but partially sweet taste from the vinegar. The only question that lingers in my mind is did I do those the right way round. At the appointed time we were led to our table in the dining room / basement area via a small staircase. The room was incredibly small without actually feeling cramped. At this point I may normally have taken the time to describe the décor in the room, however what I failed to mention earlier was that while queuing up outside, we happened to be queuing next to a pub called The White Horse which allowed you to take drinks out on the street, therefore by the time we made it to the into the dining room via the bar I was fairly well sozzled. The part where my memory didn’t fail me though was with the food. 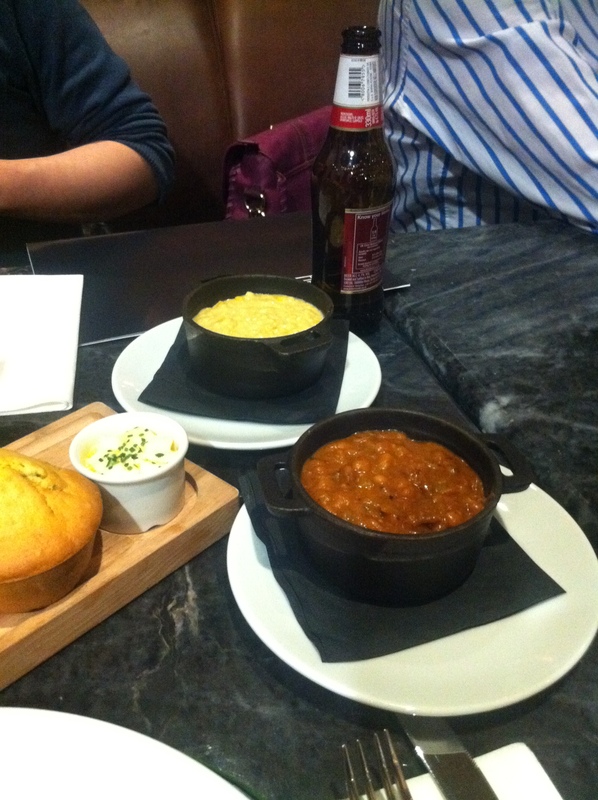 The special of the day was Braised Ox Cheek (£15) which comes with a selection of pickles for two sides, the baked beans and the chipotle slaw. The slaw was runny but amazingly spiced and the beans superbly cooked in a barbeque flavour which was tangy and savoury-sweet. The braised ox cheek was a magnificently cooked piece of meat. Having an incredible rich smoked beef flavour coming from this tender meat which came apart under the knife with an excellent consistency that was just joyous. I was forced to stop at several points to make small moans of approval before continuing on. 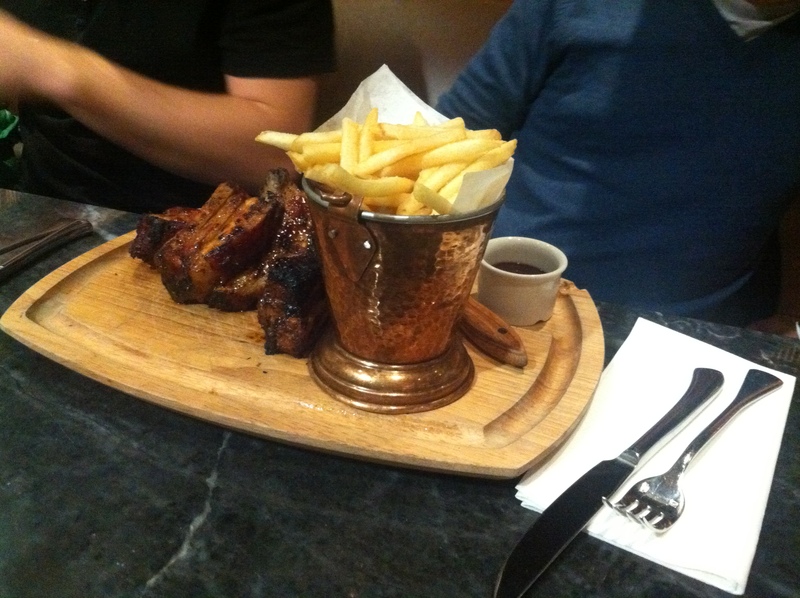 The beef ribs were of equal note having an intensity I previously thought reserved from for a prime cut of fillet steak. Even managing to retain its pink inner texture. 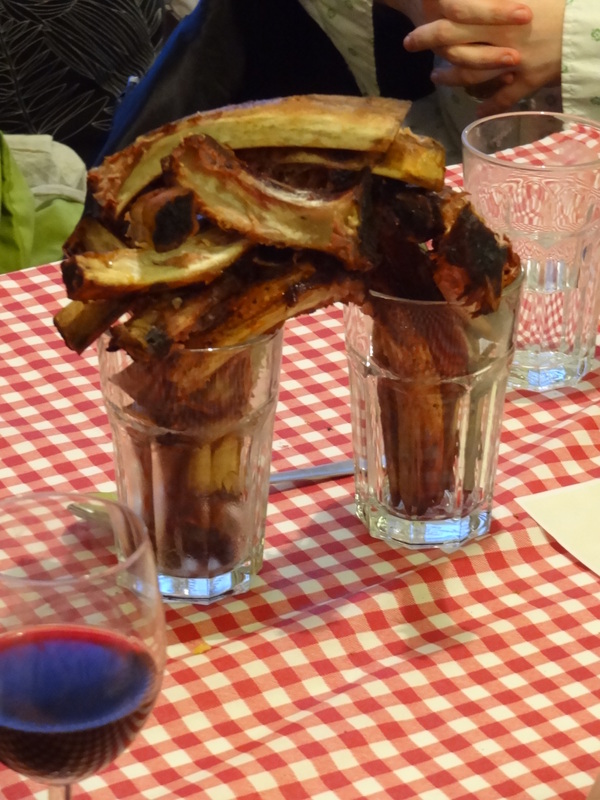 And the true stand out champion for the side dishes was the bone marrow mash. A bone marrow jus atop a puree-creamy mash was almost too much flavour to hold in one jar but still subtle enough to play side dish to the brilliantly cooked meats. Look at the freaking beef ribs. Served with smoked chicory. Determined to at least find fault with some part of menu, we opted for dessert and shared a chocolate and raspberry brownie, but to no avail. 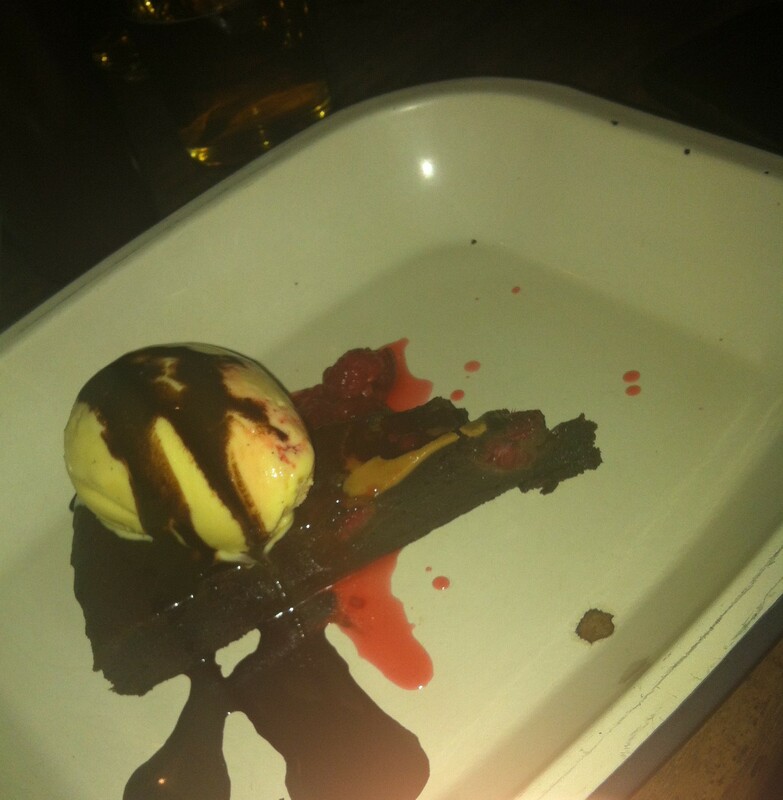 It was indulgent, well complimented with the slightly sweetened raspberries and topped with a vanilla ice-cream and chocolate sauce to add that final finishing blow of sugar indulgence. Raspberry brownie and ice cream. I want it now! When we finally surface from the dining room / basement we were all fuller, happier people and clear in the knowledge that Pitt Cue Co. have a created somewhere which offers flavoursome barbeque with no compromise in intensity or flavour than you would find anywhere else. 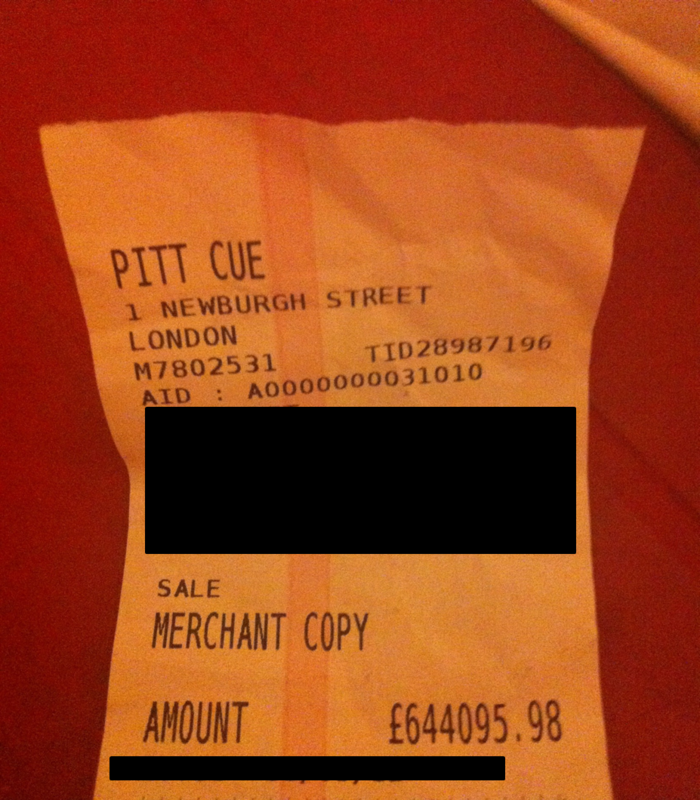 As an addendum, we did receive a slight shock at the bill the first time round as some extra noughts and numbers were added to it, as you will see below. The meal actually came in a little cheaper than this. You may notice at the top of this blog is a tab called Project PIG. If you haven’t been there first, Id suggest you do. This will give you all of the background and shortly will contain much more about the day and the build-up. 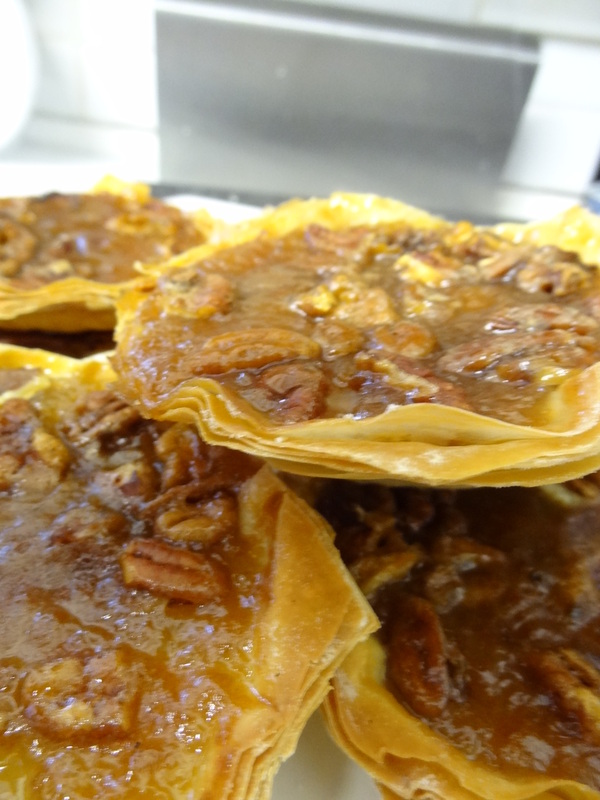 This post is to give you some highlights from one of the tastiest days of the year. 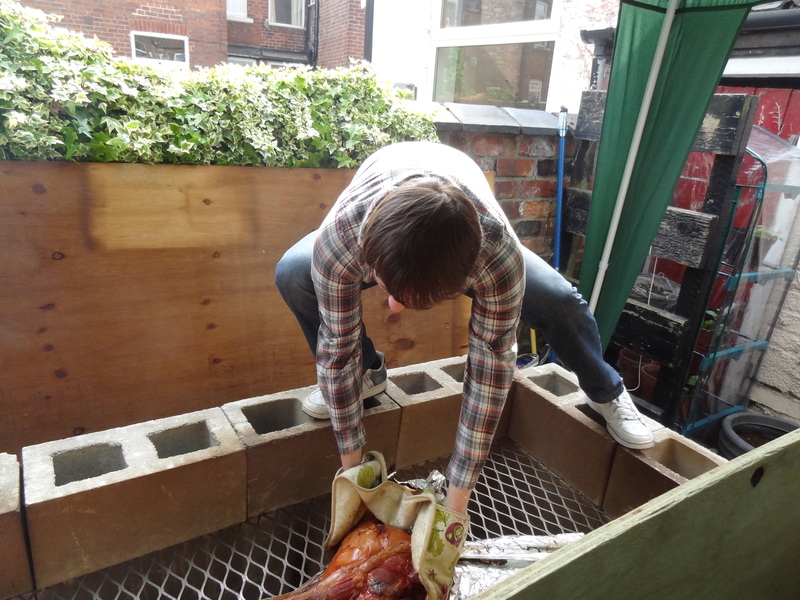 Project PIG had one aim: Could a man with zero pit barbecue experience, take a 30kg pig, a pile of building materials and a sack of ingredients and turn them into succulent, salty, juice-ladened pork. The answer was unreservedly: Yes! The feedback was insane. Everyone loved it and I mean loved it. I am going to post a ‘How To’ guide from the event. In total it took use three days to construct, test and cook with the pit that we built and I managed a full three hours sleep on the day that we cooked the thing. But this post is about the food not the build. So let’s see the stats on how this little piggy was made into a prize-winning hog. Firstly the pig. We got ourselves a half pig because I couldn’t physically fit enough people into my house to eat a full size boar. The pig was dressed and provided by W.H. Frost in Chorlton, a top-quality butchers if ever there was one. The also scored the meat before it was dropped off at my car. Once the pig was home, that’s when me and the boys (and girl) went to work on it. Step one was an all-over olive oil rub to crisp up the skin. The low cook temperature of the pit meant we couldn’t just rely on the heat of the flame like you would with a hog roast. Once that was done, next came the injections. The meat was injected with a sweet marinade made up of apple, white grape, lost of sugar and salt. 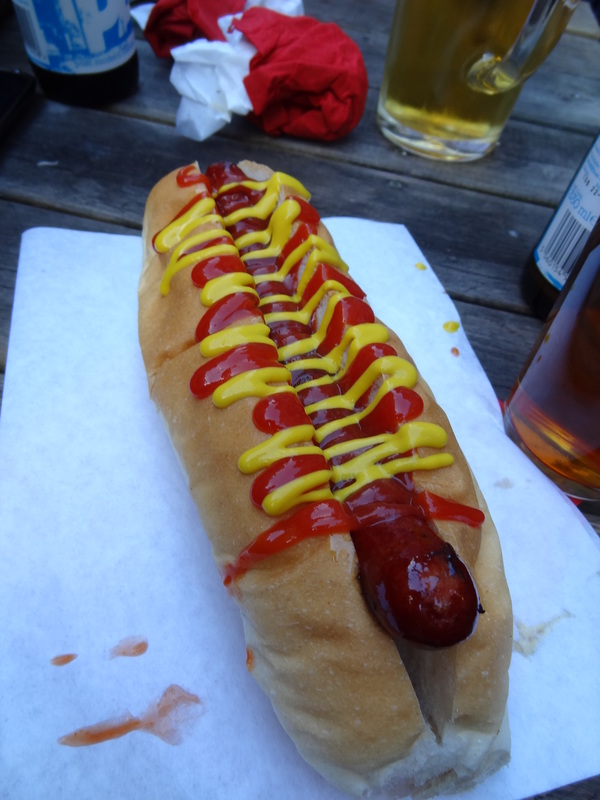 This was to keep the meat sweet to go with the smoky flavour from the barbeque. This took a while and by the end we were injecting marinade through one hole just to have it pop out of the other (weird). The final step to this process was the dry rub for the inside. A mix of cayenne, garlic powder, paprika and several other sugars and spices went into the inside cavity for extra flavour onve the fat started to melt. 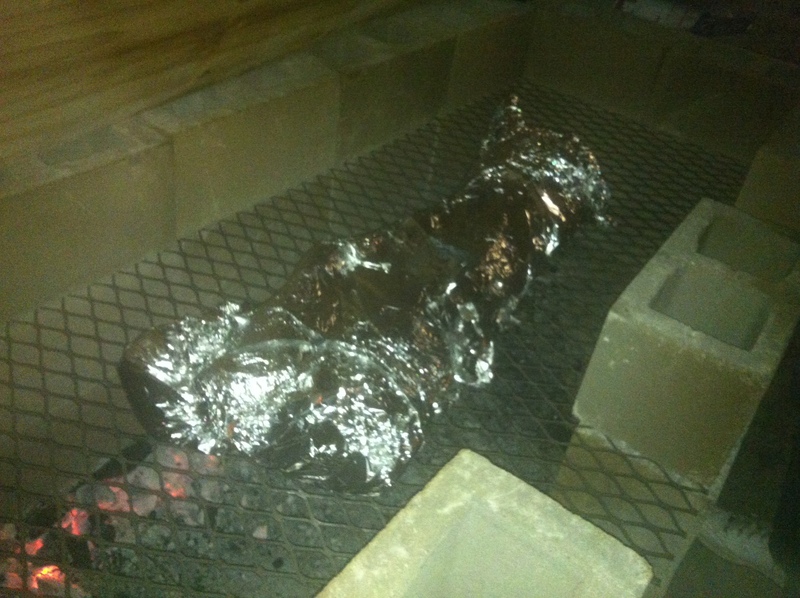 The next day, we had to strip the foil off the top of the pig. It had turned a glorious red and there were clear signs aroung the exposed meat of where a smoke ring had started to form (a ring of colour showing the depth of penetration of smoke into the meat). Half an hour before serving the pig needed to be flipped. Being either brave or sleep deprived, I climbed up onto the grill to flip the pig. 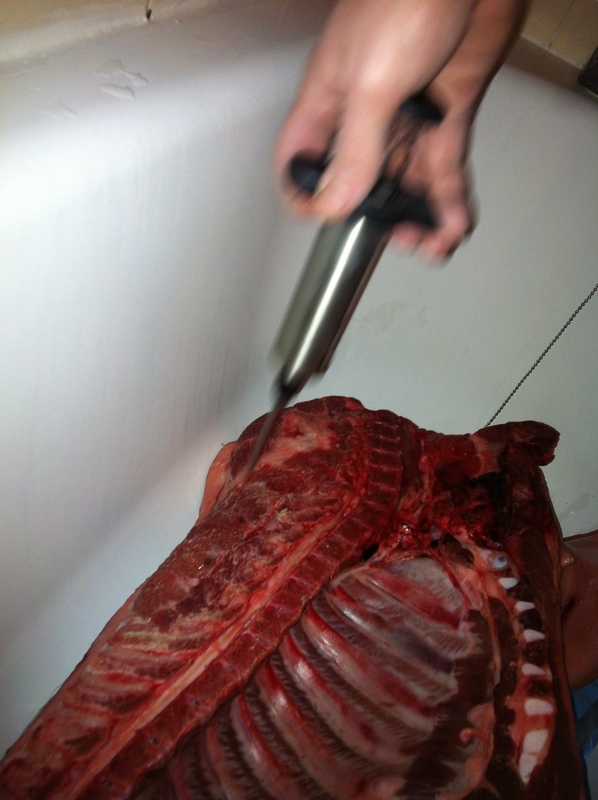 As we flipped, we realised how soft and juicy the meat had gone as it almost felt apart on the flip. Just about holding it intact, we gave it a glaze with a secret barbeque sauce using ketchup, garlic, spices and sugar to give it some extra zing. It then got covered for 30 minutes to finish. When it finally came out, it was epic. The glistening glaze on top of that thick, succulent pork was captivating. 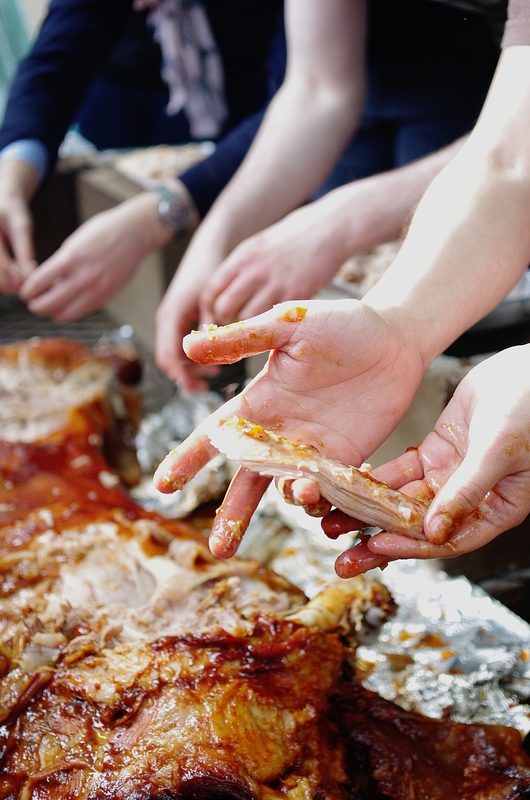 So being a good host, I encouraged the guests to engage in the time-honoured tradition of ‘pig picking’: Pulling the pork of the pig with your fingers. There was trepidation at first but soon there was jostling at the grill as more and more hands dived in to tear tender meat from this awesome grill. 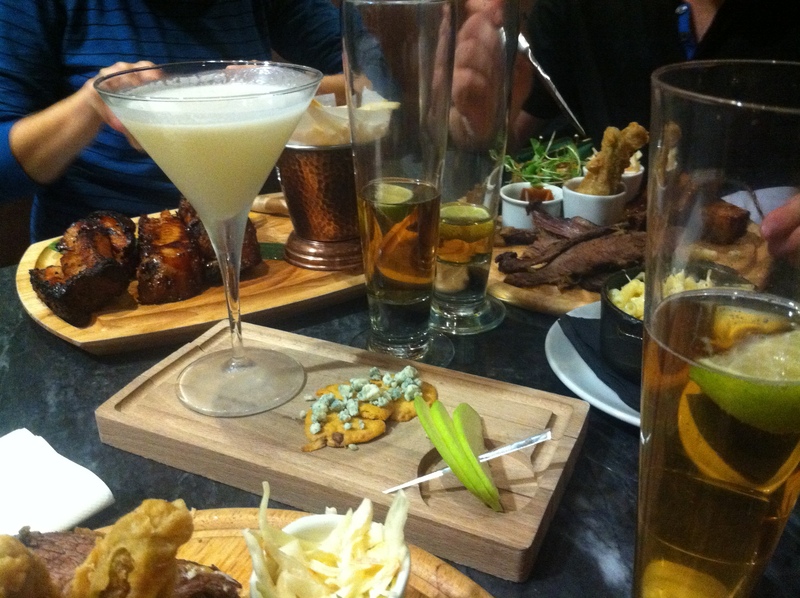 The carnage was immense, the flavours were epic but most importantly the diners were happy. Very happy in fact, and while the day is over, my house still smells like a Texan barbeque hut and my fridge is full of crackling and pulled pork. Despite this, the best part of the whole thing was the event it made. The meal had a certain pageantry to it, with the exposing of the pig, the flipping of the meat, the glazing of the skin and the devouring of a masterpiece nearly three full days in the making. My only regret is that I’m not cooking another one right now…. @mangechester: Reading the twitter feed for @AlmostFamousMCR. I’d gladly not blog a word about it to get into one of the launch nights. Sounds epic. This was in response to their No Bloggers, No Photographs policy. So I’m in a pickle because I’m a blogger but also a man of my word. I’m also a squirrel, but that’s not improtant right now. I had to make a decision to blog or not to blog… which is when I decided to do both. I promised not to write a word about Almost Famous Burgers, so I haven’t. 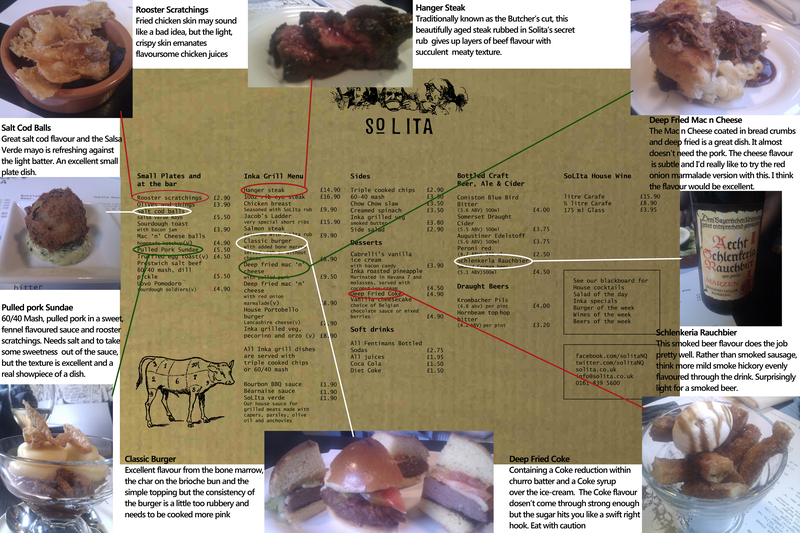 I have taken all of the menus and leaflets that I was handed at the door and used them to make a short write up. Not a single one of these words is mine. In fact this is written more by the guys at Almost Famous than by me, so thanks guys. Here’s their review… of them… which I made…? I was down in London a few weeks ago staying near Euston station. 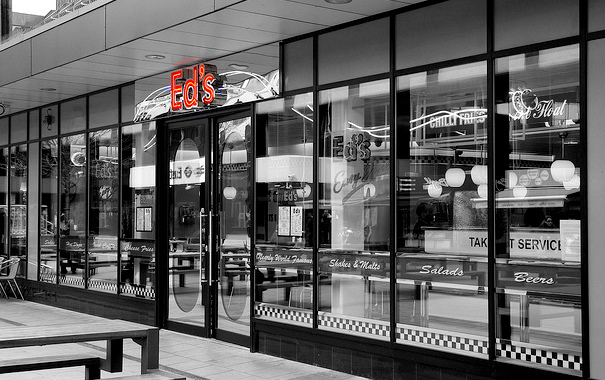 Anyone who’s been through Euston will have probably spotted Ed’s Easy Diner outside. Giving that 50’s rockin’ vibe to diners since 1985, Ed’s is a small chain with a good rep and good food, but on this particular occasion, I went for one dish. 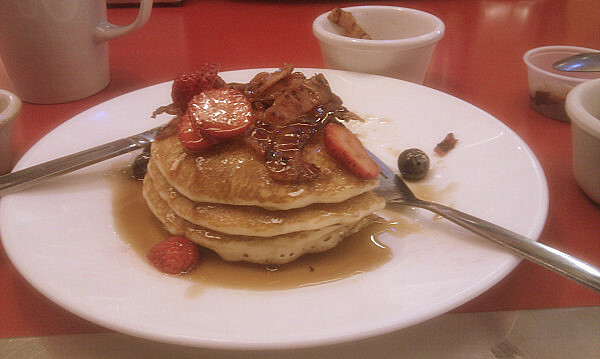 Ed’s All American Pancake Stack. I decided that if I was going for an American diner breakfast staple then it needed to be done properly, which is why I opted for the bacon on top. The flavour was great. The fluffy, thick pancakes sucked up the maple syrup like no-one’s business and the strawberries and blueberries, while not the most flavourful, fitted in great. What I didn’t expect was for the bacon to work in there so well. I’ve had these salty/sugary breakfast combos in the US and not been won over, as an uneaten croque-monsieur covered in powdered sugar showed in San Diego. This one was perfect the crispy bacon giving the fluffy pancakes the crunch they needed to stop this dish becoming monotone. There was also the light smoke from the bacon that just made such perfect sense when mixed with the sweet syrup. I’m not saying much more. From a diner, you’re really looking for simple, no-nonsense and tasty plates of food. Ed’s is doing a pretty stand up job on this front. For anyone in the Midlands, Ed’s has now opened up at the Selfridges in Birmingham and I’d I’ll keep an eye out for it in Manchester, but if you’re stopping in, try the pancakes, or at least let me know what else is good on the menu. Can't even remember what this cocktail was called but look at it. It comes with cheese for God's sake!! Searing summer heat radiates down as we walk across the bleached white stone-covered car park. The wooden shack we’re heading to is cobbled together from a blend on mesh, stone and timber covered in flaking paint. This fragile-lookingstructure holds something much more wondrous than you would imagine; the finest smoked brisket, sausage and ribs in Texas. I don’t normally start a review of one restaurant by talking about another; however the taste of good home-style ‘Deep South’ barbeque takes me back to that smoke shed in Texas. Southern 11 fits nicely into Spinningfields by pulling off the slick interior and ambient lighting which almost seems to be a pre-requisite for restaurant ownership in the area, however much like that shack in Texas, the appearance is misleading (I’m not sure if I’ve over-used my trip to Texas enough in this post yet… I went to Texas you know). 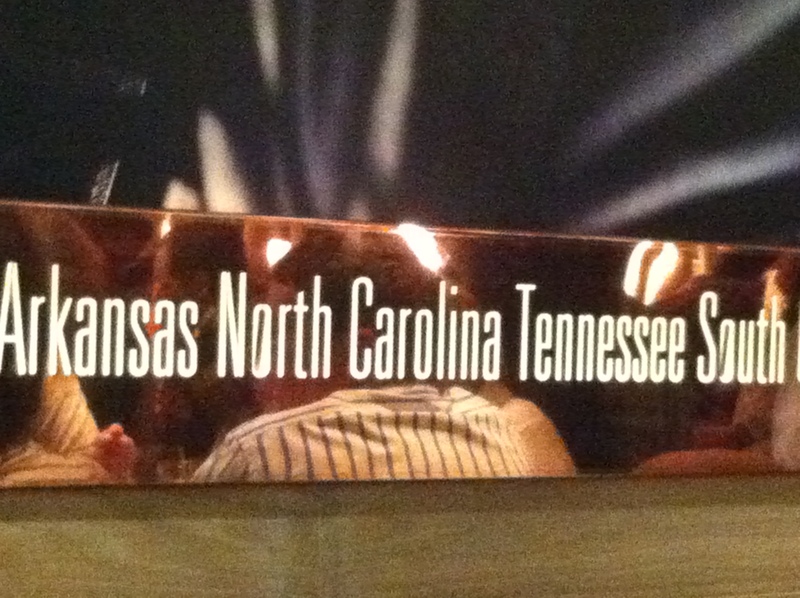 Inside you’ll find a restaurant that is putting out plates of authentic barbeque food and at very reasonable prices. 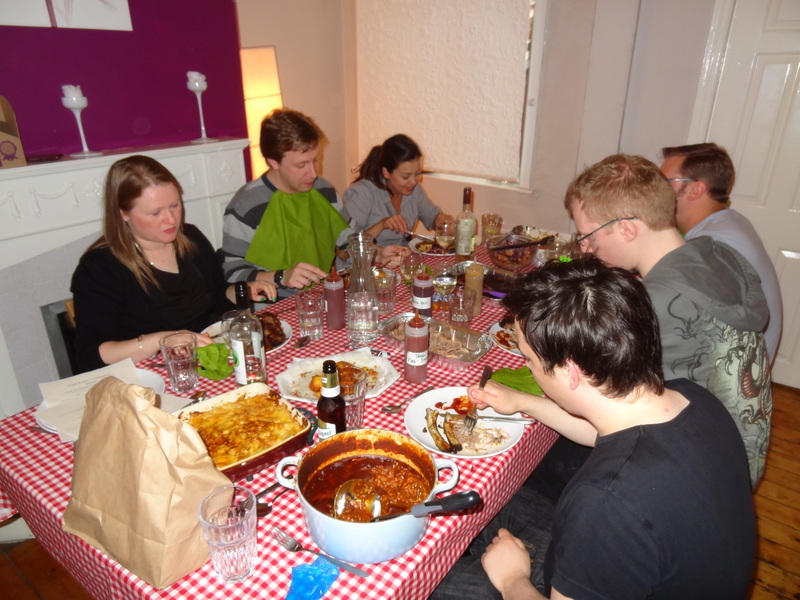 I took a few friends along with me so that we could eat party style: a few mains and all the sides we could stomach. Fried chicken, smoked beef brisket, pork ribs and pulled pork. The smoke cooked meat is always tender due to the low heat and long cooking process allowing the meat to retain all its moisture while absorbing the smoky flavour. 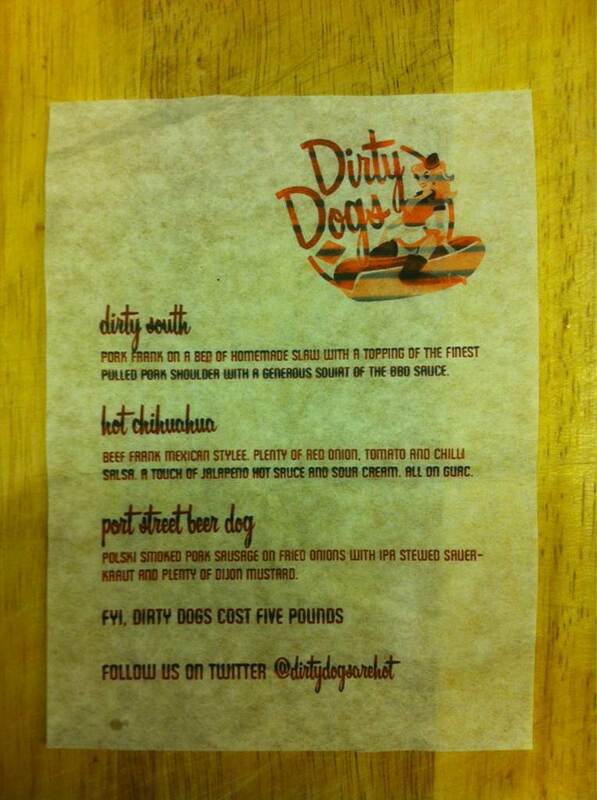 The pulled pork was a great example of this, being salty, moist and beautifully flavoured by the hickory smoke. As I said in my previous blog from the Manchester Food and Drink festival, the only slight disappointment (and I do say slight) is the brisket. A slow smoked brisket (8 hours or more) will have what’s called a smoke ring running through the meat demonstrating how much flavour it’s holding. This is where the ribs swing into play to save the day. Tender, meaty and embalmed in a sticky BBQ glaze, they hit you with the sweet bbq sauce before delivering the finishing blow with the great rib flavour. All of that’s great but you need a break from all of that meat, so I started to work through the sides. The parmesan truffle fries were just exceptional. Never before have I been so wowed by chips, but a cheesy, intense flavour from a light, crispy chip is too good not to rave about. 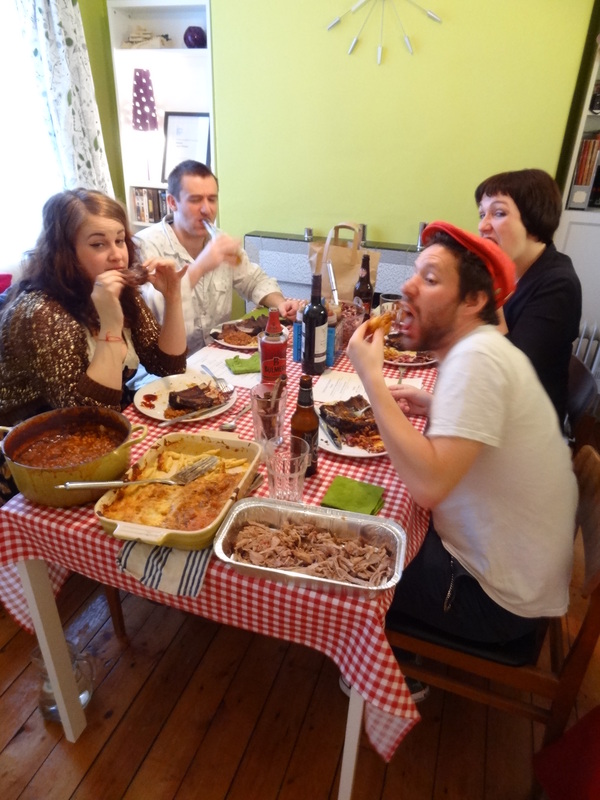 The barbeque beans were a favourite on the table and avoided the trap of just being beans in a gloopy BBQ sauce. The spices in the sauce cut through the sauce creating a warming sensation inside that is as much emotional as physical. My personal favourite side though had to be the sweet corn pudding. Now this I had never come across. I think Nigella Lawson summed this dish up better than I could as ‘particularly gratifying’. A sweet, sticky side that goes excellently on pulled pork over some jalapeno cornbread. My main was the Southern Chicken dinner. The name alone sparks the image of a home-cooked fried chicken dinner that the dish itself more than delivers. 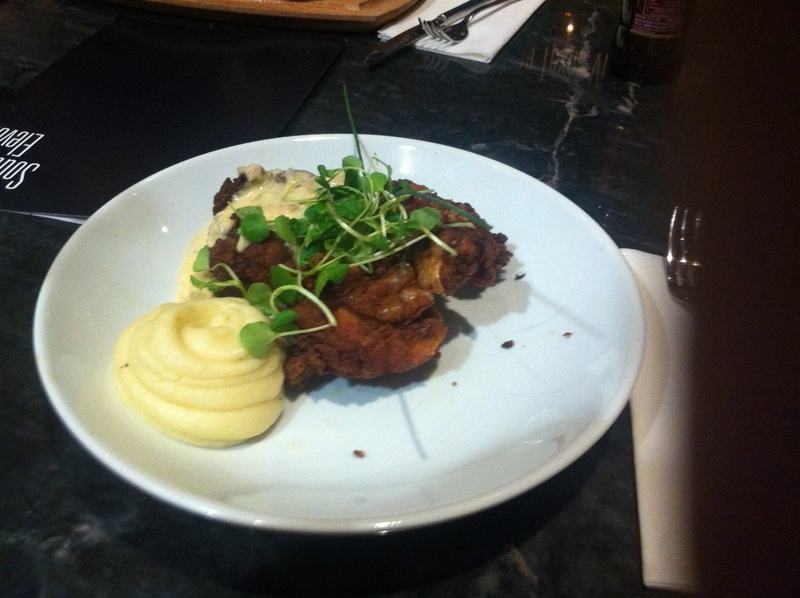 The chicken is tasty with a beautifully crisp skin that has great flavour. Add to this a slather of sausage gravy and that cripsy skin is excellently complemented. 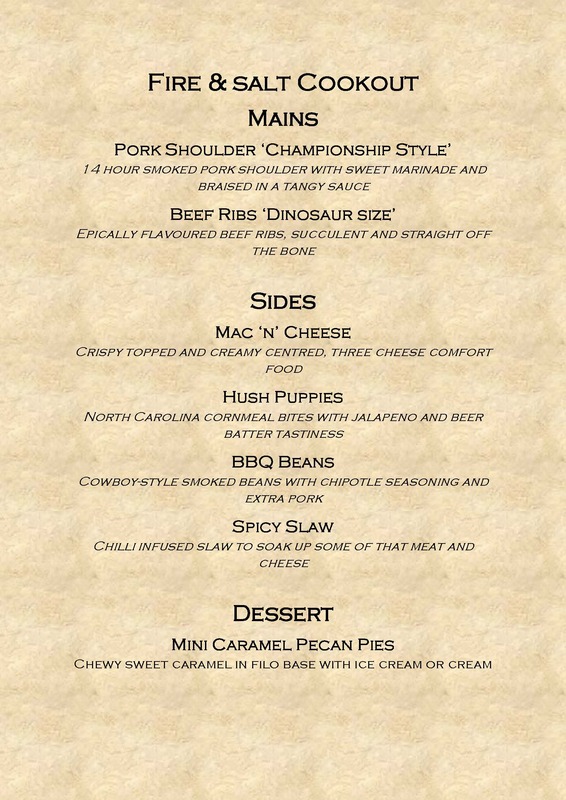 The Pulled pork however is a personal favourite of mine. Slow cooked, traditionally over an open barbeque pit, this pork is so soft it can literally just be pulled from the bone in strips. Great with the sides or just on its own I took more than my fair share from my girlfriend’s plate. What more can I say, the atmosphere was lively, the food was great, the service was friendly if occasionally duplicated with our drinks arriving several times and to cap it all of the cocktail menu was great. I got so many great shots from the meal that I’m putting even more on the facebook page. The best type of cooking is the kind that evokes emotions and pulls you straight back to another time or place. Southern 11 has this quality in spades and I didn’t even make it to the dessert menu. Still, there’s always next time.